CryptIt is a file and folder encryption application which uses 192-bit encryption algorithms in order to encrypt and decrypt files of which the user wishes to remain private. Useful as both a password manager and password protection utility, brute-force attacks are generally not effective if the password chosen is not a dictionary word or otherwise guessable. This program is also effective in protecting files and folders stored on portable USB media such as external hard drives and USB sticks. 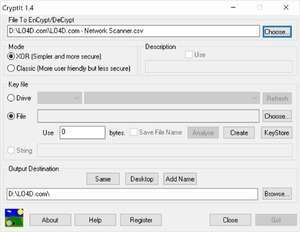 For security reasons, you should also check out the CryptIt download at LO4D.com which includes virus and malware tests. Additional screenshots of this application download may be available, too.